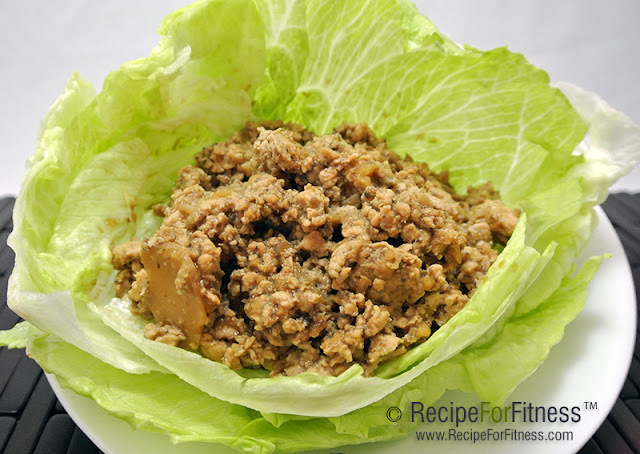 I'm a sucker for lettuce wraps. In particular, Pei Wei's Cool Chicken Lettuce Wraps. Serious yummage there, but every time I eat them, my fingers and feet swell up like crazy. Well, as I'm heading toward my trip to the Arnold Sports Festival, my diet is pretty tight - no room for PeiWei's sodium-fest. So what's a kitchen-geek to do? Make her own, of course! Spray skillet with cooking oil. Over medium high heat, brown chicken breast with garlic and ginger (*see note below). While chicken is cooking, chop (or mince in food processor) mushrooms and water chestnuts. When chicken is nearly cooked through, add vegetables to chicken. Mix well. Add soy sauce and peanut butter and mix well. Reduce heat to low and cover, simmering for 10-15 minutes. Drain in colander or sieve. To serve: Cut open head of lettuce and remove leaves to use as 'cups'. 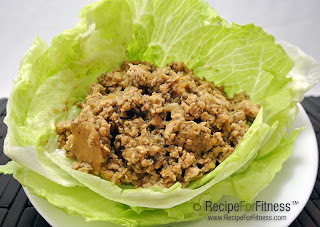 Fill leaves with meat mixture, and spray with Bragg's Liquid Aminos. *Ginger: for best results use ginger paste (available in refrigerated herb section at grocery). If using dried/powdered ginger, reduce amount to 1/4 - 1/2 teaspoon. 257 calories, 32g protein, 11g carbs, 8g fat, 2g fiber, 2g sugar, 741 mg sodium. 9g net carbs. 360 calories, 23g protein, 39g carbs, 11g fat, 4g fiber, 15g sugar, 3060 mg sodium. Look delish! Quick question-I just recently heard about and bought liquid aminos. Is there some reason you suggest only using the aminos for serving and not for the 1/4 cup of soy sauce too? I'm just trying to figure out the best way to use this product. Thank you! Yep - practicality was my reason ;-) low sodium soy sauce is cheaper than Braggs liquid aminos. That's it. If the cost doesn't bother you, then sub Braggs for the soy. I love Braggs - I spray it on steamed veggies, steamed brown rice or quinoa, chicken breast... so much yumminess! Thank u for the tip!